It is spring; a tree flowers. You may fail to notice it. Is in the nature of the tree. Please enjoy a Free Download/Peek at my Hawaii Novel @ Kindle eBooks! @Kavita: How lovely it would be to be a flowering tree in the spring! 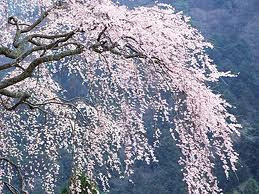 @Anil: The tree doesn't ask anybody to love it; nor does it try to impress its loveliness or goodness on the observer. The beauty and ugliness is in the observer. The same observer who loves the tree once, might come to hate it some other time - it is all in the observer and not in the tree. An environmental activist I know once said that when he started the construction of his house, whenever he saw a tree, he would mentally calculate the Cubic feet of its timber. What I have said of the tree holds good for everything - art, literature - and human beings themselves. :) Yeah! I sometimes hate the tree when it sheds those flowers and leaves on the car or on the ground and you have to sweep them off. Wonder if you are identifying with trees here in your reply?